Manxman Daniel Kneen has made his comeback to racing this weekend and the 23 year-old was soon on the pace at the North West 200, placing a fine 11th overall in qualifying for the Supersport races. 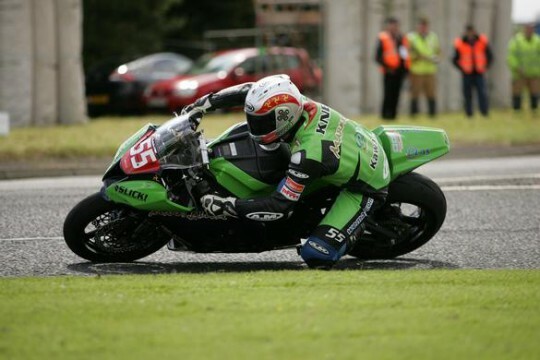 The Braddan rider was due to contest a full season in the British Evo Superbike Championship but a heavy crash at Jurby on April 17 left him nursing a number of broken vertebrae and a major doubt for the International road races. However, treatment over the last month, including a number of sessions in the Island’s hyperbaric chamber has Kneen back to almost 100% fitness and raring to go once more. "It’s definitely good to be back and apart from feeling a bit stiff and sore on Tuesday evening, everything’s being going okay. I’m using the weekend primarily to get a run out for the TT and get some miles on the bikes as I’ve such little testing but I’m feeling quite good and Supersport qualifying went pretty good so I’ll be looking for some good results come race day," he said, speaking to bikesportnews.com this morning. Kneen’s Evo-spec bike was written off in the spill but with a full complement of bikes in the stable for the North West, the Marks Bloom Racing rider is hoping to make up for lost time on both the short circuits and the roads especially at the TT where he took a best result of fifth twelve months ago in the opening Supersport race. "Obviously, I’m gutted to have missed the first three BSB rounds but, for a time, it looked like I’d be out a bit longer so I’m just looking to get back out there and get in as much racing as I can. The Evo bike’s all ready now and whilst we’ve had a few teething issues here, we’ve made progress each time we’ve gone out and I’m really looking forward now to both this weekend and the Thruxton BSB round. "It’s a step-up for me on the short circuits (Kneen finished 2nd in last year’s British Supersport Cup) but I’m excited about the challenge and just want to get going. It’s a busy few weeks for me and it will be hectic getting from Thruxton to the TT but there’s a few of us doing the same and if we can make it in time, even just for a couple of laps on the 600 on the Monday evening, it should all be spot-on." Before that though, Kneen has five races to negotiate at the North West 200 and, as well as qualifying 11th in the Supersport class, he also placed 22nd in the Superbike.